Home / Case Studies / What is the real difference between a challenger bank and an incumbent? What’s interesting watching these ads is that they’re not about money, but about life and online security. In fact, they’re just about branding. The reality is, as I was discussing the other day in building a customer-centric bank, that the banking culture has been founded on pushing products through channels. The UK PPI farce and US Wells Fargo account openings scandal are good examples of that culture and mentality. It is driven by objectives built to get the maximum share of wallet out of the customer through cross-selling. It focuses upon waiting for the customer to make mistakes, and then punish them for it. It is an inside-out view of the world, and does not appear to have the customers’ best interests at heart. However, because the customer believes all banks are the same and there’s little difference, they feel that they don’t have a choice. Because they don’t think they have a choice, they don’t care. They just use whoever they happen to have an account with, and get on with life. What I’m particularly interested in is the chart of customers opening accounts. The lighter the offer, the more the customers. For example, Revolut is mainly a payments app for easy cross-border and P2P payments, and opened the most accounts. 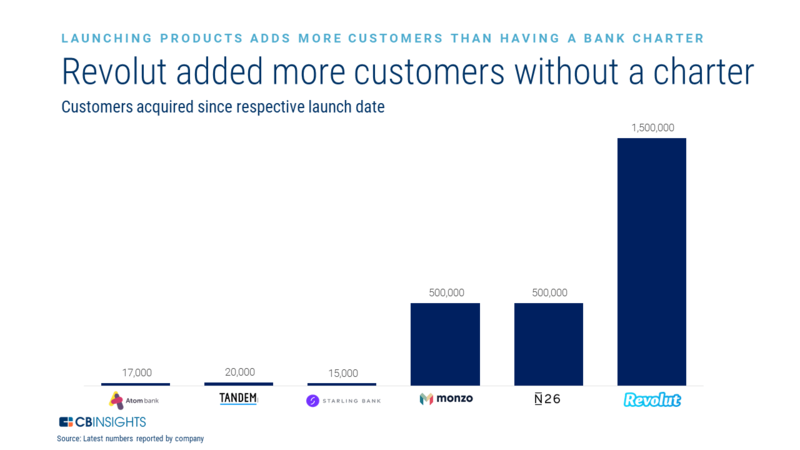 Monzo began with purely a prepaid card and no bank account, and onboarded a significant number of customers. But the banks with a full banking licence have been slow to catch-on. I think this is because making a payment or topping up a prepaid card is far easier for young people to grasp than switching their whole banking service. What would make me switch? I guess if there was an amazing curated marketplace of financial services through APIs brought to me by the bank. And the bottom-line: the new world of banking focuses on the customer, the customer’s journey, the customer’s needs and aims to fulfil them by designing from their with partnerships where needed. They do not punish the customer for making mistakes, but try to help them avoid making mistakes and rewarding them for doing so. That is what customer-centric banking is all about and it will be interesting to see how the big boys change and adapt to keep up.